This was a very exciting review to do! This product was used for my 5 year old that is just starting to learn his letters. We worked on a new letter each week. 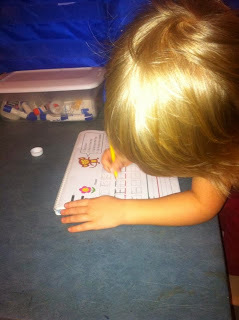 We would start on Monday with getting our letter and we would use the dry erase board to practice writing. I loved how it is blocked letters so he could see that you didn't make a T go across the complete page and so forth for similar letters. We would spend a day using this board and practicing as long as he could handle it. Other days we supplemented with other fun projects making the letter and the sound. We ended each day with practicing on the board once again. Being able to use fun colorful markers made it that much better. Although Micah is a man of blue :). On the last day of our week we would break out the workbook and write our best letters. He was very pleased to know once he finished a page there were some cool stickers in the back to put on it. The hard backing of the workbook allowed us to school in bed as well. We also worked hard at our desk! Yes we generally school shirtless :). Shirts become a detraction to those little ones with SPD and ADHD and more pulling, tugging, and chewing go on than concentration at work. Also if you notice carefully to the hand on his forehead for his deep concentration. After this lesson he told me he couldn't do anymore or he would pass out. Silly boy! For good measure he does own shirts! Overall my favorite thing about this product is having the option to practice with dry erase. Having a child with attention issues already sometimes he feels the need to scribble out the page when he gets frustrated. This is good because he can just easily erase when that happens. 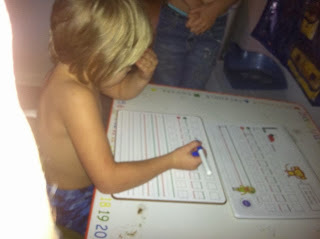 Once he is confident in writing the letter we are able to move onto the book and not have any frustration issues. Plus it is fun to be able to use for drawing on as a reward for working hard at the end of the lesson. The workbook its self is great. 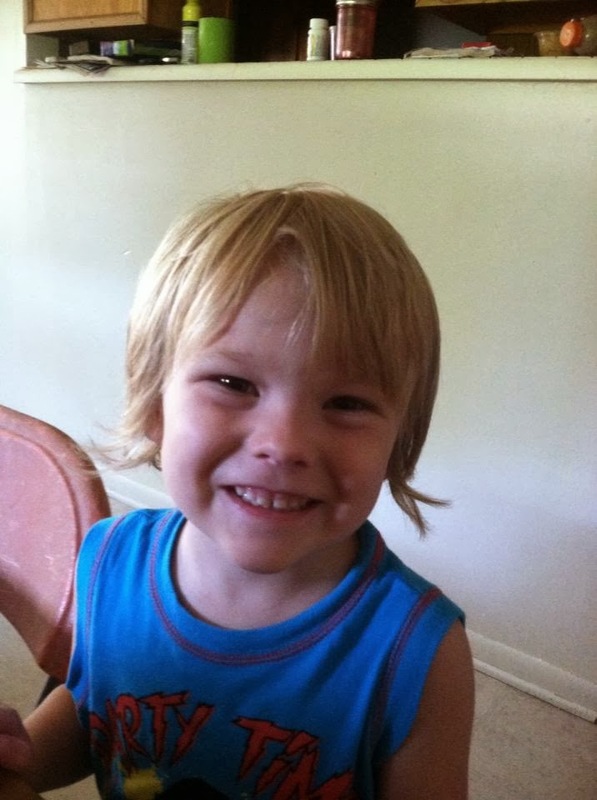 The cute pictures that go with the letters are easily recognizable for the kids. After the page is complete the back has a sheet of stickers with the matching picture and the letter bold faced on the word so they can search for that letter to put on their page. I also like that it is not in alphabetical order. They start with the simple stick letters (L, F, E, T) and then move on the the harder ones through the book. I think this builds confidence in their writing skills which helps have them pumped up when it comes to writing the harder ones later on. I can't really say that there is anything that I did not like about this program. The dry erase board was also very thick and sturdy which is great for those rough little boys (and girls :P). 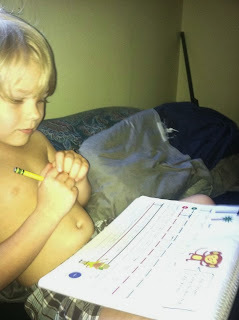 Also the binding on top makes it easy for a left or right handed kid to be able to write with ease. My 5 year old is a righty but something like this would have been so much easier for my daughter that was a lefty. She always complains about the bindings on books. Don't forget to check out other reviews from the crew. Click below!